Dwayne Johnson shared a message on his Facebook this morning ahead of the film’s world premiere. The brand new, first poster for Stephen Merchant’s Fighting With My Family has been released, and once again, it was Dwayne Johnson who announced it to the world. Johnson, who is Executive Producer of and stars in the film announced this morning that Fighting With My Family was on it’s way to it’s world premiere at Sundance Film Festival later this month and following that, the first UK poster has now been dropped. Fighting With My Family is the eagerly anticipated comedy-drama that tells the story of WWE legend Paige, played by Florence Pugh and her wrestling-obsessed family. Paige and her brother Zak (Jack Lowden) both audition for the WWE but talent scout, Hutch (Vince Vaughn) offers Paige the chance of a life-time, and not her brother, tearing the family apart as they watch Paige go on to become a WWE superstar. 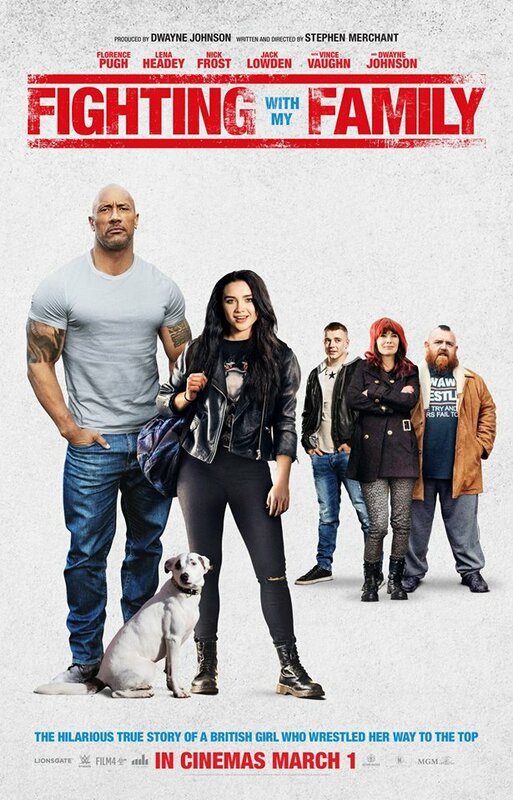 Written and Directed by Stephen Merchant, Fighting With My Family features a fantastic British cast including Nick Frost, Lena Headey and Merchant himself, with Dwayne Johnson playing his much beloved alter-ego The Rock, for the first time in a cinematic role. The story of how Johnson approached Merchant to take on the film is about as random and as funny as you’d imagine. When Dwayne Johnson was in the UK shooting Fast & Furious 6, he ended up watching a documentary on Channel 4 about the real life Bevis family, who were obsessed with wrestling and how their daughter Paige, went on to become one of the biggest wrestling stars in the world. Johnson called Stephen Merchant, having worked together on their film The Tooth Fairy and the pair started working on the project.